by Joy Skjegstad. Judson Press, 2013. Research shows that congregations are more engaged than ever in their local community. Is this true for your congregation? Or is this a new goal? 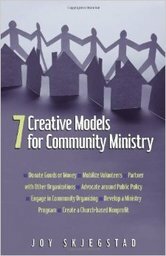 Joy Skjegstad describes seven models by which congregations serve their neighborhoods. The models she explains include creating a non-profit, donating goods or money, advocating around public policy, mobilizing volunteers and three more. The chapter on choosing the right model for your congregation provides you with specific criteria by which to evaluate your direction. Skjegstad is the former director of a Minneapolis church based community development group. She now serves as a trainer for those interested in connecting congregational life to the needs of the local community. This volume is recommended for any congregation that is wanting to take their mission beyond the door of the sanctuary. Standing at the threshold of the worship space and Main Street can both excite and overwhelm. This book helps you manage the possibilities and get headed in a direction that is right for your faith community.